We have about a gazillion unfinished projects that we are working between the mountain cottage and at our house. There are more like 20, but it FEELS like a gazillion. Well, this week, I started one more project in the midst of all the others, which, in turn, created at least 5 or 6 MORE projects for the room. Oy! I started on the new paint for our laundry room! and do a few more projects. I am happy to announce that I finished a painting project for the laundry room! Sometimes when you're in the middle of a gazillion unfinished projects you have to do a small one to give yourself a sense that you've accomplished something! Our laundry room was green paint and black accessories. It was definitely time for an update. This accessory above our key rack needed a makeover since we are lightening things up in the room. You have to love spray paint for a quick and inexpensive update. So, off to Lowe's I went to pick up some supplies because of the 20 cans of spray paint on my shelf, none were white! 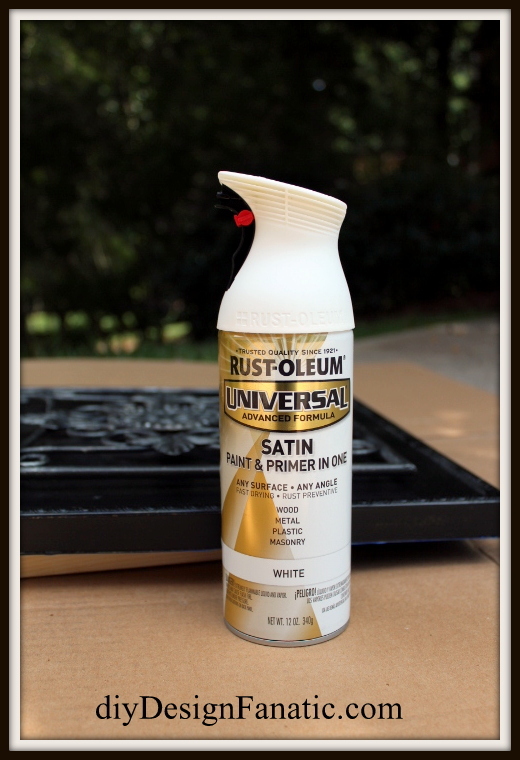 This was the first time I used Rustoleum Paint & Primer In One. I really liked the ergonomic handle and spray trigger. I sprayed several coats, letting them dry thoroughly between coats. After that, I sanded the metal to let it show through the paint. ... 5 or 6 projects to go. A fresh coat of paint makes a big difference. Love the new color, so pretty and it is nice and light. The plaque looks fantastic. I havn't used that paint either, need to give it a try. I love the way the can looks. I hadn't seen these, I need to spray paint a few things I think I am going to try it. Amazing how something white can lighten and freshen up a space with such little effort. Those small projects eventually add up to big ones! Great job. Looks pretty! I think I'd like that paint. I have a hard time with the regular cans.